8 km of hiking trails including portions of the Gold Rush Cariboo Wagon Trail; campsites are large, quiet & peaceful offering spectacular views of the Coast Mountain range; park is a great base camp for Stein Valley treks and white-water rafting tours. 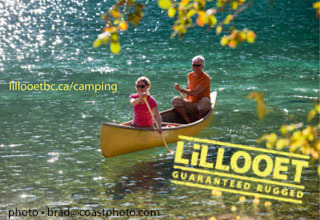 58 campsites; flush toilets; sani-station; picnic area with pet walk & fabulous Thompson River Canyon views. 6 km east of Lytton on Hwy 1.